Hey, and while we're at it, let's all have a day of remembrance for Adolf Hitler! Actually, we should have a national day of remembrance for all the worlds fallen mass-murdering martyrs and freedom fighters. We could remember such famous faces as Idi Amin, Pol Pot, Jo Stalin, Kim Il Sung, Chairman Mao, Benito Mussolini, Robert Mugabe (oh wait, he's not dead yet...SEAL team anyone? ), Nicolae Ceaușescu, and who could forget our 'old friend' Saddam Hussein. How about Easter Saturday? Anyone else keen? 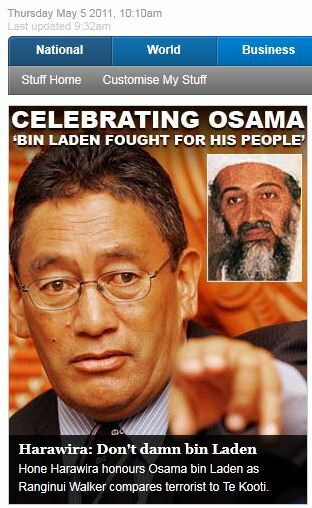 Independent MP Hone Harawira has apologised for his comments on Osama bin Laden's death. Harawira, speaking in Maori on TVNZ's Te Karere, said the slain al Qaeda leader was a fighter for "the rights, the land and the freedom of his people". His comments had been seen as support for bin Laden's actions which was a mistake, he said. "Using terror for political reasons is never acceptable," he said in a statement this afternoon. He apologised for how he expressed himself. "As Maori we do not speak ill of someone who has died even if such a person has done bad things." Earlier today Prime Minister John Key said Harawira's likening of Osama bin Laden to a freedom fighter was a "ridiculous statement". I view Harawira in the same way as I view a piece of dogshit on the sole of my boot - with repugnance. the man is a rabid racist through and through, but dangerous as a "politician" with the ear of the media. Truly, the fruit doesn't fall far from the bough! A reader wrote: What do you get when you cross racists with communists? Please Invite your Emergency Services co-workers and friends to join your network and keep the community growing. » "Being choked just part of job for top dog"
» What's happening to our wine? » Thoughts to those involved.